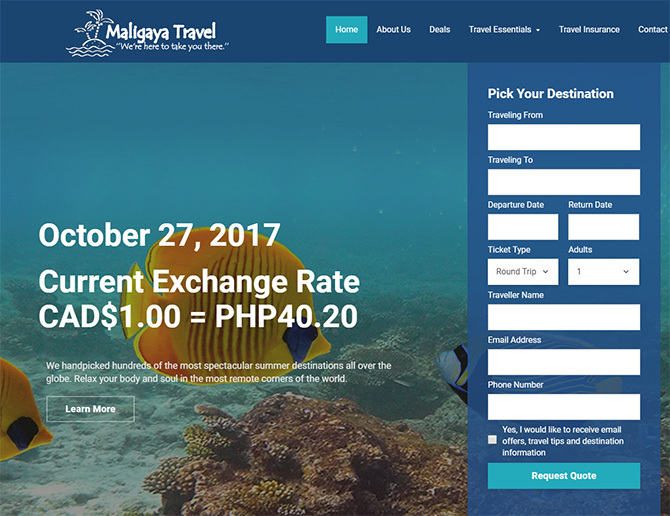 Maligaya Travel was looking for a platform to drive online traffic to, from social media platforms, that would allow customers to request travel quotes. Using DotNetNuke (a content management system) as a launching platform for the website allows them to quickly and easily change the travel deals and exchange rate on their website. Keeping the information provided to their customers current, enables clients to take advantage of the best deals being offered! Dynamic airport lists on the homepage travel quote form grab airport information from an xml file that Maligaya can edit as desired to expand their offerings to smaller local airstrips. This information is searched instantaneously by customers as they type into the origin and destination text boxes.